G'is the first chapter in Soma Games’ Arc Saga andis a gorgeously rendered take onthe classic gravity golf genre of puzzle games. Gorgeous hand painted art, eerily atmospheric music and a deep, compelling storyline make G more than just a puzzle game. As the first chapter in a four part series, G'introduces you to a steampunk styled world where corporate intrigue and competing mercenaries all vie for their share of the unknown promise. The Rain - blessing or curse, its arrival changes human history for ever...and you will play a part. 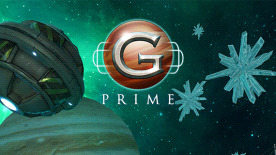 If you like Gravity Sling, Blast Off or Gears of Gravity, you’ll love this game!